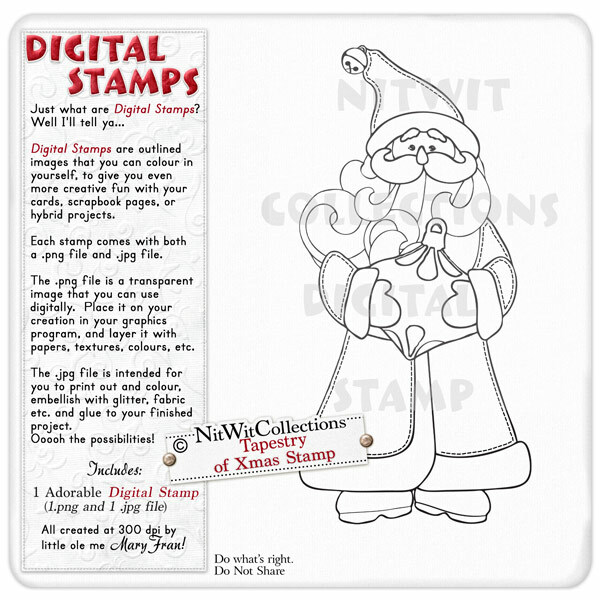 "Tapestry of Christmas" Digital Stamp is our old world type of Santa holding a Christmas ornament. Imagine how you could embellish him to give him the grandeur and greatness that he deserves! A great creative addition for your card making, scrapbooking, and hybrid scrapbooking projects. Stamp is created as an 8in x 6in approx. image so that you can resize it to fit your creation. 1 Tapestry of Christmas Stamp (2 files - 1 image is a .png file and 1 is a .jpg file format).